Our wildlife gardening articles highlight how important it is to provide places to hibernate over winter for the many types of insects beneficial to our gardens. And many of you are no doubt using ‘insect hotels’ of one sort or another for this purpose. 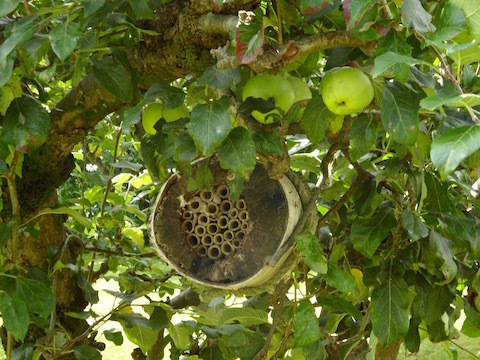 If you have fruit trees or bushes, especially ones that produce blossom early in the spring, then you might like to try putting small insect hotels in your trees – as shown in this picture – so that pollinators will be ready and waiting as soon as the weather warms up and the blossom buds open! Butterfly Conservation have posted their annual report on the Grizzeled and Dingy Skipper butterflies in Nottinghamshire. Rushcliffe is one of the colony areas for the GS. Please see attached.